Today, let’s take a sweet trip down memory lane to when Jaffas were made by a company called ‘Sweetacres’ and came in a box, Hoadleys made something called a Polly Waffle and a box of MacRobertson ‘Old Gold’ had soft and hard centres. It’s amazing to think that such a simple thing as the packaging of a chocolate bar can revive so many memories. Candy bars and lollies were a pretty rare treat when we were growing up. Our parents had very little spare income to spend on such indulgences for the kids, but occasionally there might be a 3d or a 6d from grandma or grandpa, a kind old great aunt, or something left in the bottom of the Christmas pillow case. Photo from ‘longwhitekid’. This Jaffa Box is likely from the early-mid 1960s. I think they were running this design for a while so it could have been around up to the late 60s. Imperial weight only shows it was definitely produced before 1972 . My first memory of Jaffas was in the box. Jaffas were sold in movie theatres and have gained iconic status because of the noise they made when dropped (accidentally or deliberately) and rolled down sloping wooden floors. James Stedman-Henderson’s Sweets Ltd first made Jaffas 1931. The orange coating on Jaffas was developed by a Sweetacres food chemist, Tom Colston Coggan. He experimented with many syrups before settling on the flavour that is unique to Jaffas. The confectionery is still made in Australia by Allen’s Sweets (a division of Nestle), and are now sold in cellophane bags and (I think) still taste the same. Polly Waffles first came onto the market in 1947, made by Hoadleys. Apparently it was conceived by the company accounts supervisor and family friend Mayfield B. Anthony. Hoadleys was sold to Rowntrees in 1972 and then onsold to Nestles in 1988. In mid-2009 a new recipe for Polly Waffle was released along with new packaging. The new product was the same in appearance as the older product, but contained a more sugary centre and a more brittle wafer. Nestlé announced on 23 November 2009 that Polly Waffle was being discontinued after 62 years due to poor sales. (Damn, I’d love a Polly Waffle). The original Violet Crumble came to the market in 1913, Hoadleys had produced a chocolate assortment and packed them in a purple box decorated with violets. The packaging was in tribute to Mr Hoadley’s wife, whose favourite colour was purple and favourite flower was violets. 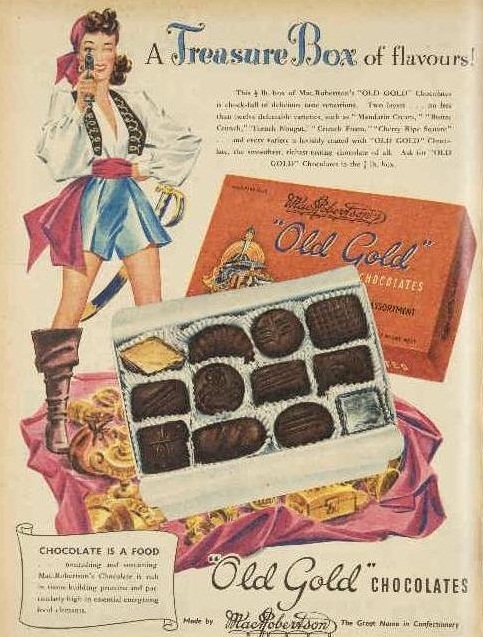 Within the box assortment was a piece of honeycomb that became so popular that Hoadley decided to produce an individual honeycomb bar and the Violet Crumble was born. Hoadley again used his wife’s favourite flower, the violet, and registered the name Violet Crumble, using a purple wrapper with a small flower logo. It was an instant success. Nestles still produce a Violet Crumble but in 2009, changed the shape to a wider, flatter bar. The honeycomb formulation was also changed to make it shatter into small pieces when bitten into. Remember when dad used to buy mum a box of MacRobertson Old Gold chocolates for her birthday and we’d all get to choose a chocolate from the box. They were all in little brown patty pans and we’d always like the hard centres because they lasted longer. Photo from Pinterest. The Old Gold box of chocolates had soft and hard centres. Macrobertson Chocolates was founded in 1880 by Sir Macpherson Robertson. They made the original Freddo Frogs, Cherry Ripes, Old Gold (box of chocolates) and Snack chocolate blocks. MacRobertson was sold to Cadburys in 1967 and they dropped the Old Gold box and the Snack block but kept Freddo and Cherry Ripes. What are some of your memories of lollies and chocolates as you were growing up? Cadbury did continue with the Snack chocolate block, as they did with Cherry Ripe and Freddo Frogs. I’m sure you can still get them! Polly waffles will be available from Jan 2015..
My sister and I went to the movie ” The Story of Ruth” a rather gory biblical type film. Lots of blood and lepers etc. I fainted during the film and dropped the Jaffas. They rolled away and my sister still reminds me of my ‘crime’. Hoadleys also did if I remember correctly a rocky road, the best rocky road ever, I sure wish you could still get them. And the old Polly Waffle was a treat, I can’t understand why sales dropped. I believe you are correct with that Jaffas packet around the mid 60s. I was about 10 at the time and have vivid recall of it. I would guess around 1967-68 they changed to the longer white box with the orange jaffas on the cover wrapped in plastic. As stated, it was inevitable that each visit to the cinema was met with someone losing their entire stash of jaffas on the wooden floors just after intermission. Things were never the same when they started putting carpet on the floors. I agree with you. The Luncheon Bar was awesome. I would love one now!! I think Luncheon went out earlier than that. It hasn’t been around for a long time. Tex Bars were also discontinued probably in the 60s. They seem to have suffered the same fate as Marella Jubes and Chocolateens, two of my Sweetacres favourites. “They don’t make lollies like they used to! Polly Waffles suffered poor sales purely because of the change of recipe. Nestle ruined a beautiful bar with that sugary cone. It was terrible. MacRobertson chocolates were always delicious. Modern cherry ripes taste nothing like the old ones. In fact, no chocolate in the last few years tastes as good as it did in the past. I don’t think it is me but that they have changed the composition and added more sugar. The dark chocolate was always so smooth and rich but not too strong. Does anyone else remember Black Cat chocolates? They came in a flat white box with (I think) a red ribbon and a small black plastic cat attached? Was it you in the Regent Theatre in Rundle Street firing Jaffas at the bald head of the organist who was playing movie melodies at the left of stage prior to the films starting ???? Thank you to Robern Menz a South Australian who has bought Violet Crumble back fro Nestles! Could you please buy back Polly Waffle and return to the old recipe? Also the Luncheon Bar! My husband has been lamenting the absence of the Luncheon Bar for years. He says it was the the best chocolate bar ever. Peter Ferguson was the only person to mention the Tex Bar. My favourite when going to the flicks in the 50s. A chocolate covered bar with a delicious light malty fudgy centre the likes of which has not been around for decades. It isn’t only Polly Waffles that Nestles ruined by changing the recipe. All the classic lollies, Fantales, Minties etc, have been turned into chewy lollies that dissolve in 5 mins. Their chocolate coatings are cheap compound chocolate, and to top it off they have discontinued the Club chocolate that they inherited from Smalls.